In this issue: a cruise back through time, a reality show on the moon, and new breakthroughs in genetic research. 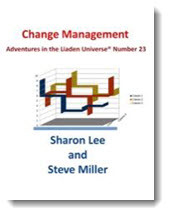 All that plus a new Liaden Universe® story by Sharon Lee & Steve Miller. What was supposed to be a relaxing cruise becomes a nightmare when the modern-day cruise ship the Queen of the Sea is transported through time and space. Now two thousand years in the past and afloat in the middle of the Mediterranean, the passengers and crew of the Queen of the Sea must band together to find a way to survive in a chaotic world—and start to build a brighter future. 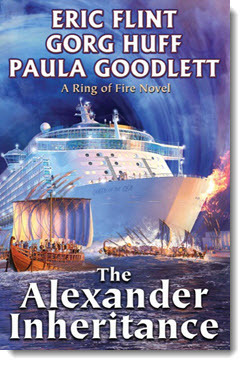 Get The Alexander Inheritance eARC here. 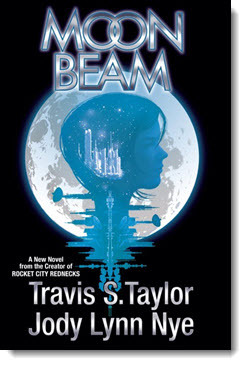 Get Moon Beam eARC here. Cargo Master Therny Chirs likes to do things by the book. But when massive amounts of money are on the line, others prefer to cut corners. But doing so often spells danger. Now, what is supposed to be a routine pilot recertification test takes a turn for the worse, and Chirs finds himself embroiled in intrigue he wants nothing to do with. 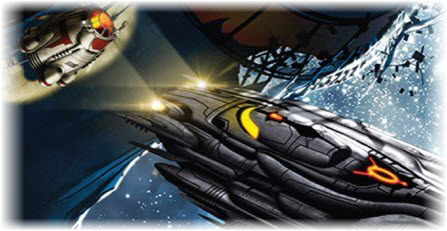 An all-new story by Sharon Lee & Steve Miller set in the Liaden Universe®, with latest entry The Gathering Edge out next month. 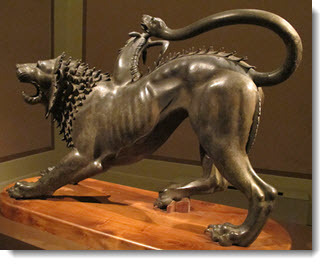 The chimera: a mythical beast described in Homer’s Iliad as having the head of a lion, the midsection of a goat, and the tail of a snake. A fire-breather made up of various pieces of different animals. In this month’s nonfiction essay, genetics researcher Dan Kobolt takes us to the cutting edge of the field to discuss how modern science is creating chimeras—not those of myth, but just as fascinating—and explores how science fiction has used chimeras as storytelling devices. Read “Chimeras: Science and Science Fiction” here. 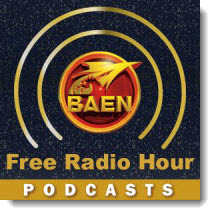 Coming soon to the Baen Free Radio Hour: Eric Flint and Griffin Barber on Ring of Fire novel 1636: Mission to the Mughals, and Larry Correia talks about the leatherbound edition of Monster Hunter Vendetta and reflects on writing the Monster Hunter series. Missed past episodes? No problem. We’ve got every episode archived for your listening pleasure. Barbara Winton has been following one reality show for years. Then in an instant she goes from fangirl to participant when the call comes from Dr. Keegan Bright: She’s been selected out of a horde of applicants to join him on the Moon. But Barbara soon learns that life on the Moon is a far cry from safe, civilized Earth. All new stories of the weird, wild west. These tales aren’t the ones your grandpappy spun around a campfire, unless he spoke of soul-sucking ghosts, steam-powered demons and wayward aliens. Includes stories from Larry Correia, Jim butcher, Kevin J. Anderson, Alan Dean Foster, Sarah A. Hoyt, Jody Lynn Nye, Michael A. Stackpole, and many more. When the first expedition from Earth reaches Alpha Centauri III, it makes a startling discovery: all life, including humankind, is governed by the Throne World. The Earth is a mere outpost in a vast star empire. Jim Keil was a superman on Earth, but on the Throne World he is nothing more than a “wolfing,” a trained pet whose sole purpose is to entertain the High-Born. But Jim Keil will show the High-Born that the people of Earth aren’t so easily tamed. When Marine Private Oliver Chadwick Gardenier is killed in the Marine barrack bombing in Beirut, he’s given a choice: Go to Heaven or return to Earth, where the Boss has a mission for him. He's a Marine: He'll choose the mission. For more than 20 years, fantasist Bruce Taylor has been entertaining readers all over the world with his masterful blend of surrealism and magic realism. Now these stories have been collected, along with new work. From the vaguely sinister adventures of Mr. M. to the “Bradburyesque” boyhood exploits of Edward, Taylor’s tales showcase an imagination at once intense and gentle, absurd and cutting. Times are perilous, violence rife, and the future uncertain. Success and the survival of all you hold dear may hinge on how you manage change. 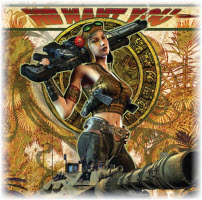 Here are two Lee and Miller stories set in the Liaden Universe®: “Street Cred,” original to this chapbook; and “Wise Child,” reprinted from Baen.com. Both stories with the complications arising from decisive change, and decisive Change Management at the point of peril. The often humorous—and sometimes heartbreaking— true account of one Navy SEAL’s year of combat in what had been a Viet Cong stronghold until the SEALs took control and Charlie placed bounties on the men with green faces. It is the first inside story of a Navy SEAL medic, a man who wanted to heal, not to kill, but did both to save lives. Heaven doesn’t want them. Do they stand a chance in Hell? The second omnibus volume of Rock Band Fights Evil by D.J. Butler, author of Witchy Eye. Contains three complete novels, Devil Sent the Rain, This World Is Not My Home, The Good Son. The hilarious, gripping story of The Cleaners continues. Dani struggles in her job with the supernatural cleaning company that keeps reality tidy and safe, but she faces her nemesis against Sydney, the entropy-wielding Scum whose very touch can turn anything to dust. In an age of augmented reality, love is found in the most dangerous places. Stranded on Mars, washed-up megacorp programmer Derek Tobbit is caught in a conspiracy that could threaten the solar system. Based on the popular Interface Zero game from Gunmetal Games. It’s 1953 and scientist-turned P.I. Noel Glass tries to clear his name after an experiment goes awry. A clandestine organization is trying to conquer the world using his “failed” invention, but Glass and his team of unlikely allies stand in their way.